Investment Property Refinance, Made easy! With the recently amended federal government tax legislation the answer is quite possibly nothing in fact, it can actually pay you! Unlike your current home or principle place of residence (PPR) you not only have a contribution towards your mortgage payments, being a tenant but also some significant financial benefits through depreciation and shortfall allowances. 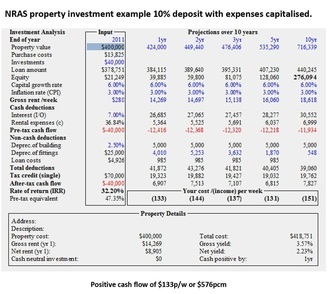 What this all means is through purchasing an investment property you are able to reduce your annual tax position therefore paying less tax, have a someone pay the major portion of your investment property mortgage, can be up to (92% in some instances) and be positioned to have an asset that in time 7-10years will look to double in value. Should you look to apply the national rental affordability scheme (NRAS) with your strategy this can offer positive cash flow whilst reducing your tax bill or liability significantly. Your specific financial position today and in the future will ultimately determine the most appropriate course or strategy to apply to your wealth creation goals. The type of asset based on gearing (tax optimisation) style (house & land townhouse for example) and financial structure can then be most correctly applied to offer you the best opportunity of achieving your end goal sooner. That being said, so how much does it really cost. You can find out now, using our in house property investment analysis software. This will provide you with an in depth understanding of the costs associated with purchasing and borrowing, rental income and expenses, tax optimisation, cash flow and much more assisting you to make the right informed decision. FREE Property Investment Analysis Report. Take advantage of our free Property Investment Analysis report to help you determine when the right time to invest in property could be. The report will be individually based on your specific financial position(s) and will offer comprehensive information as to the viability of such an investment to you. In addition, any question you may have can be answered and an understanding of the investment process provided. Reduce your tax and increase your asset base with a cash flow positive investment today.